The following was originally published two years ago under the title "Wild Things." Here it is, perhaps because I wanted to post the beautiful photograph by Alex Saberi again. One morning last week I woke from a harsh nightmare. Unlike Ebenezer Scrooge, I did not attribute the unpleasantness to indigestion, nor did I take the Jungian approach of exploring the meaning of the dream. I spent most of the day grocery shopping and doing other mundane errands. In the late afternoon, I took my dog for a walk in a nearby park. Close enough for me to hear their pounding hooves, four beautiful deer rushed by. Awestruck, I stood very still and watched them till they disappeared in the woods. My dog was also still. I remembered a line from Wendell Berry's extraordinary poem The Peace of Wild Things and for a long while, I rested "in the grace of the world." 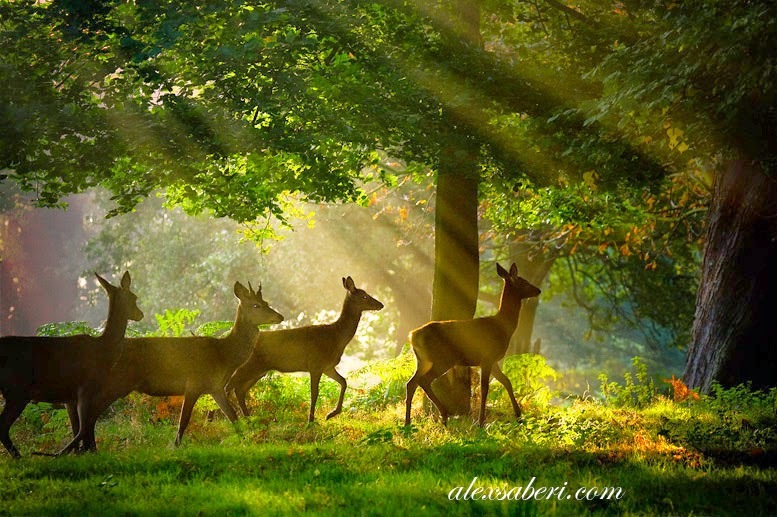 How odd and wonderful that the very next day when I logged on to Pinterest, the first photograph I saw was an image of what I had experienced in the park -- the stunning photogragh by nature and wildlife photographer Alex Saberi. His photograph is of red deer in Richmond Park in England and I saw white-tailed deer here on the Eastern Shore, but much of both - the dark trees, even the formation of the four deer, is startlingly similar. In myths and fairytales, creatures aid heroes and heroines. Ants, an eagle, and even Cerberus, the three-headed dog, help Psyche complete the tasks jealous Venus sets for her. Pigeons, doves, and other birds all come to Cinderella’s rescue with deeds and song. In reality, animals delight us with their easy grace whether a cat curled in sunlight or deer running free. I have lived in large cities most of my life and my love of nature is a late affair. There is so much I simply do not know. But I do know a blessing when it gallops before me on an autumn day. To see a larger version of the above photograph entitled "Fairytale" and other photographs by Alex Saberi, click here. Photo: Alex Saberi, All Rights Reserved. Reprinted by permission of the photographer.